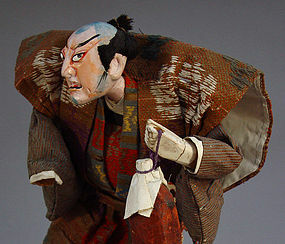 Takeda dolls are modeled after the popular characters from the theater play during the Edo period. They are known for their exaggerated posture and facial expressions of the puppet dolls and kabuki actors on stage. The dolls in this style, with the distinguished Kabuki actor’s makeup called ‘kumadori’ (first created by Danjyuro Ichikawa I, 1660-1704) were made in late Edo to early Meiji period. The dolls might have been sold in large cities such as Osaka and Edo(Tokyo) where the theaters were. People from the small towns could have gone up to Kyoto and the neighboring city, Osaka, to sell their products and with the money they earned, swing by to visit one of the theaters. The dolls could be purchased as souvenirs or to be sold. Condition: the small crack on his left dimple (shown in the photos) is carefully filled with gofun (same material used on his face), the lines shown on his face are mostly original paints with some minor hair lines along this nose. The line shown on his hand is on the surface. It is solid. The wood stand is slightly warped - we finished the reverse side (not painted side) with some furniture oil. Most of similar dolls that we had seen showed some damages. This doll is about 150 years old, 12 1/2" tall on the stand (18 1/4" x 7 3/16").